It took 8 years for science to catch up with what was going on with Olympic dopers in 2004.Â This goes to show how far ahead of the curve the science of doping is (an always will be). Â The "bad guys" have the money and the time to invest in drugs and techniques that will forever remain at least one step ahead of the "detectives". At the high school and university levels, very little (relatively speaking) is being invested in testing regimens designed to be current state of the art.Â The dangerous part is when we have a public that is ignorant of this perspective at the same time that school officials and politicians have a vested interest in presenting test results in such a way that they make sure that their institutions remain perceived as bastions of "clean sport", i.e., "we don't have a steroid problem in our school". And, there is no independent agency at the university or high school that has a charter to insure that testing results are aggressively implemented and that steps are being taken to challenge the status quo in our efforts to detect doping at these levels. Who, for example, is storing testing samples so that future technology can be applied to the players on this year's championship university sporting teams?Â For example, will urine samples from this year's BCS Bowl winner be stored so that we can go back in 5 or 10 years and know whether we had a group of players using APEDs that are undetectable using today's technology? While these steps may be being taken at the elite levels of sport, I know of no one who is advocating for this level of serious testing at the high school or university levels of sport.Â Until we do, we must not let ourselves be fooled into believing that our current testing protocols present anything close to an accurate picture of the amount of doping that is going on among our young people.Â Just look at the U. of Minnesota survey results released last month as a tangible picture of what is really going on among our kids.Â And if those numbers accurately reflect what's going on in the general student population, imagine what the numbers really are in that segment of kids that are playing sports!Â Yet, to listen to school officials, the doping problem in university and high school sports is virtually non-existent. While driving to the Atlanta airport on Wednesday, Adam Nelson may have won a gold medal in the shot-put at the 2004 Summer Olympics in Athens. 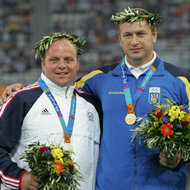 Adam Nelson of the United States, who won silver, left, and Yuriy Bilonog of Ukraine, who won the gold in 2004 for shot put at the Olympics. Adam Nelson of the United States could end up with the gold medal from the 2004 Olympic shot put. 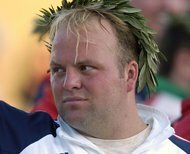 In what could amount to one of the more peculiar outcomes in Olympic history, Nelson ascended to first place more than 3,000 days after the competition when doping officials ruled that the athlete who originally won gold at the Athens Games, Yuriy Bilonog of Ukraine, was guilty of using performance-enhancing drugs. His urine sample had been reanalyzed, and steroids were detected. Nelson's triumph, as it were, was unceremonious. He did not stand atop a podium, and the national anthem did not play. He was in his Mazda3 hatchback when he heard the news. "I'm still processing this one, but the 2004 Olympics were a really special moment for me," Nelson, 37, said. "My wife was there, a bunch of my friends from college, my family. We competed at the birthplace of the Olympic Games. The downside of this is I feel like our country was robbed of a medal at the relevant time. One of the biggest parts of an Olympic career is when you hear your anthem and see your flag when you stand on that podium. That's something I can never replace." Doping protocols allow for officials to store samples for eight years and retest them for substances they may not have been able to detect at the time the sample was taken. When Bilonog's sample was analyzed in 2004 at the Olympics, the results were negative, doping officials said. Eight years later, with new tests at their disposal, officials decided to re-examine about 100 samples from the Athens Games, focusing on certain sports and medalists. The subsequent test on Bilonog's sample found evidence of the steroid agent oxandrolone metabolite. "Additional analyses were performed with analytical methods which were not available in 2004," the International Olympic Committee said Wednesday in a statement. Bilonog was among four track and field athletes stripped of the medals they won at the 2004 Games. The others were Svetlana Krivelyova of Russia, who won bronze in the women's shot-put; Ivan Tsikhan of Belarus, who won silver in the men's hammer throw; and Iryna Yatchenko of Belarus, who won bronze in the women's discus. "Athletes who cheat by using doping substances must understand that just because they get away with it one day, there is a very good chance that they will be caught in the future," John Fahey, president of the World Anti-Doping Agency, said in a statement. Track and field's world governing body now must decide whether to officially alter the standings in light of the penalties or merely void the positions of the offending athletes, an I.O.C. spokesman said. The stripping of Olympic medals is not unprecedented, though it is uncommon so many years later. Tyler Hamilton, the American cyclist, lost his gold medal from the 2004 Athens Games in August after he admitting to using banned substances. The Chinese women's gymnastics team lost its bronze medal from the 2000 Sydney Olympics nearly 10 years later because one of its gymnasts was found to be underage at those Summer Games. Documents, admissions and court testimony revealed after the fall of the Berlin Wall that East Germany had engaged in a state-sponsored system of doping. However, officials of the International Olympic Committee have said they would not strip former East Germans of their medals because of an eight-year statute of limitations imposed by the World Anti-Doping Agency and the impossibility of determining whether all the other medalists were clean at the time. A gold medal, however belated, would be a crowning achievement for Nelson, whose career has been successful by many measures but often seemed snakebitten. He settled for silver at the 2000 Games in Sydney, then appeared to have the gold in his grasp four years later when the event was staged in Olympia, Greece, the site of the original ancient Olympics, and was one of those Games' iconic events. Nelson was leading, but fouled on each of his five remaining turns. Bilonog tied Nelson on his final attempt, and Bilonog won the gold medal on a tiebreaker based on his second-best throw. Nelson's parents, Lynne and Will Nelson, were there, sitting under the searing sun on the grass area reserved for spectators. "The stadium was a big dust bowl," Lynne Nelson, who now lives in Washington, said Wednesday. "It was so hot. But we were so excited. We just felt like he was at the top of his career. But when they went into that tiebreaker, I can't even imagine what our blood pressure must have been." Missing out on the gold, she added, "was heartbreaking." Nelson competed in the 2008 Games in Beijing but did not win a medal. At the United States Olympic trials this summer in Eugene, Ore., he failed to qualify for the London Games. When he returned home to Georgia, Nelson said, he continued to train and was "full speed ahead" on competing for another four years. But Nelson became concerned that his sponsors might not stick by him as his performance waned. The health insurance policy he had through the United States Olympic Committee was nearing expiration. About three weeks ago, Nelson said, he decided to retire and transition into a different role in the sport. He is an officer of the track and field athletes association, a group that has challenged an I.O.C. regulation that limits how athletes can promote their sponsors. "I felt like I was leaving the sport better than it was when I started," Nelson said. "And that's a big thing. There are ways for me to stay involved without training. I want to help athletes have a voice, and that's become a real passion for me." Nelson called his mother to tell her the news about Bilonog's positive drug test. "It's a little bittersweet after eight years," she said. "We're just thrilled, but we're in shock." Nelson, who also has a gold medal from the 2005 world championships in Helsinki, Finland, said he was not one to show off his hardware. His two Olympic silver medals are stored in a sock drawer, he said. He was unsure what he would do with an Olympic gold. "Maybe I'll have to hoist it on a flagpole or something," he said.